1 How to pronounce the word latte? 2 How to prepare a latte at home? Latte - this is one of the varieties of coffee with milk, invented in Italy, as Italian latte means milk. Interesting, Italians drink prepared differently, than today it is cooked in other countries. Latte in Italian using grade mocha and add the warmed milk in it. In other countries, a latte is usually made on the basis of espresso, to which is added the heated milk, placing a top layer of the whipped dairy foam. She prepared an easy, volume, air. How to pronounce the word latte? often argue, how to speak latte, with the accent on the first or on the last syllable? If consider, that the word latte - Italian, his right to say so, as is done in Italy, with the accent on the first syllable: Latta. but often,, Russians say this word in the French style, with the accent on the last syllable. In the strict sense, dictionaries, we recommend that it is the Italian transcription, but it really has become a tradition in Russia, that often, especially in cooking, us more familiar French accent on the last syllable, so it is hoped, that it will be accepted and officially legalized. How to prepare a latte at home? Nothing is difficult to prepare a latte at home there. Desirable to have a coffee maker with a function for an espresso. In accordance with instructions on preparing espresso 30 ml. If the coffee maker is not at home, the prepared batch of coffee in Turku. Use only pure spring water bottled or filtered water, it does not spoil the taste and aroma of coffee. Parallel loans milk, it should not be less than 3,5% fat, whole, otherwise the foam will not work. It will take three parts of milk to one part coffee. milk heated (but in any case, do not boil) in a separate vessel to 40-50aboutWITH, and some milk, (about 1/3) whisk until light and airy foam using corolla, mixer. Empty cup of latte heated, Pour espresso, two heated milk and one part of the whipped dairy foam. Your latte is ready! 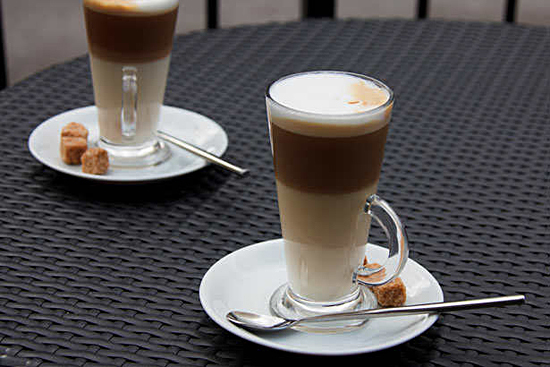 We latte varieties exist, eg, latte macchiato, the main difference of which is, it is not the milk added to the coffee, coffee and gently pour on top of frothed milk, and then again frothy milk. This beverage has a beautiful layers, is fed into a high glass glass. Mokachchino (mokachino) made from chocolate or latte with chocolate syrup, often decorated with whipped cream. Latte can be prepared for every taste - Ice cream, with chocolate, with cream, with rum, cinnamon, pop, especially successful with many people think of black currant syrup. So that, Experiment on health, and look for your latte.